Just after the competition finished, one of the North Korean students disappeared. It was reported that he was holed up in the South Korean consulate in Hong Kong. To prevent any retaliation from North Korea, the Hong Kong government sent police from its Counter Terrorism Response Unit to keep a 24-hour watch over the Far East Finance Centre, the building where the consulate is located. The governments of Hong Kong, China and South Korea have refused to comment on the incident. But one thing is certain: without help from a powerful organization or person, this 18-year-old North Korean student simply could not have gotten away from his group, in which everyone was surely keeping a close eye on everyone else. It is fairly uncommon for citizens of North Korea to escape to Hong Kong: they are far apart geographically, and there are tight border controls between Hong Kong and mainland China. However, in 1996, a North Korean family of 16 was smuggled into the island. In the end, the South Korean government received them. They were lucky, compared to the tens of thousands of North Koreans who get stuck in China or are sent back to North Korea by the Chinese authorities. After Kim Jong-un took power, he announced that all “traitors” who attempt to defect from North Korea would be executed – along with their families. 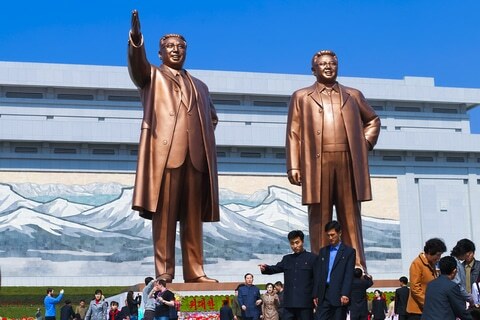 The Chinese government has since begun to loosen up restrictions on North Korean refugees, for humanitarian reasons. When Beijing starts to talk about “humanitarian” concerns, you can be sure the situation in North Korea must truly be horrific. At the moment, an unnamed North Korean general is on the run in China; his destination is Seoul. He differs from other defectors in that he is carrying $40 million in cash. The general had been responsible for managing the money sent back by North Korean laborers working overseas inrestaurants or construction sites. Much of that money is designated for Kim Jong-un’s own personal expenses. In mid-July, North Korea’s deputy ambassador to the United Kingdom, Thae Yong-ho, defected to South Korea. Since then, Kim Jong-un has ordered that all families of diplomats stationed overseas must return to the country. So far this year, six North Korean diplomats in countries including Russia, Bulgaria and Thailand have defected. Mr. Thae is the most senior official yet to do so. The deputy ambassador had lived in the UK for about 10 years. Normally, diplomats are required to change stations after three years in one country, but Mr. Thae’s family held special privileges. His father, Thae Byong-ryol, fought alongside Kim Jong-un’s grandfather, Kim Il-sung, in the guerrilla resistance against Japan’s occupation of Manchuria in the late 1930s and early 1940s. He rose to the rank of four-star general in the North Korean army before he died in 1997. Kim Il-sung valued the elder Thae’s loyalty highly and later devoted a long paragraph to him in his autobiography. He failed to mention, however, that both of his sons were educated in UK schools, paid for by hardworking British taxpayers. Of course, Mr. Thae’s responsibility was to promote North Korea’s image in the West. But despite all his superlatives for his home country, when he was called back, he simply decided to take his family to South Korea. The surge of escapes has struck at the heart of Kim Jong-un’s regime, while Mr. Thae’s defection has caused a tremendous stir in North Korean diplomatic circles. It was no surprise that Mr. Kim was furious when he heard the news and ordered those who were not able to stop the defection to be executed – by antiaircraft gun. This seems to be the dictator’s new favorite method of killing political enemies. In the past two months, both the country’s defense chief and its vice premier were executed in this way. Hundreds of people, including officials and the victims’ relatives, are forced to watch these cruel and bloody shows as a warning. There is an old saying in Korean for this type of scene. Roughly translated, it goes: “Punish one to warn a hundred.” However, the old, more vivid Chinese idiom, “Kill the chicken to frighten the monkey,” seems to fit better. The reasoning goes that a monkey fears the sight of blood – seeing a chicken violently killed would terrify it and cause it to submit easily, no matter how rebellious it was before. It is rumored that Kim Jong-un’s late father, Kim Jong-il, loved to shout at the people around him: “You are all pieces of meat – without me, you are nothing, not even worth being alive.” In the Kim family’s eyes, every North Korean is their slave, no matter what title they hold. “Freedom” is absolutely forbidden. The Kim regime describes North Korea as a “heaven” – the only paradise on the planet – while South Korea is deplored as a “hell.” But as more and more North Koreans find out what life is like outside of their country, they seem willing to risk their lives to escape this “heaven” and move to the “hell” that is South Korea.